Steele Justice is 1980s cheese-action gone sour. Here we have a film having trouble deciding whether it wants to delve into every 80s cliche (by doing this, it cribs far too much from other good to average 80s action films) and unintentional humor (which sadly, only comes in brief spurts). The film stars Martin Kove as John Steele who we meet in Vietnam in the 1970s. How tough is Steele? Well he’s got a great set of neck ware with his plastic snake necklace. Sneak in your pets by disguising them as your regular army gear. I promise the next clip isn’t from Hot Shots, as this is Steele Justice seals the deal with the incredibly silly rat with grenade attached to it. And we’re only 5 minutes into the film. I’m not even going to bother including the scenes that follow up involving Kove having a gun that shoots knives because this movie just starts out with actions that would make Italian rip-off cinema blush. I’m also not including it as the movie suddenly changes tone completely and drops any goofy weaponry when the film announces that it’s about 15 years later. Steele find his partner killed by Vietnamese gangsters who have also offed his partner’s family. The last family member remaining is Cami played by Jan Gan Boyd. Boyd is manicly miscast looking to be just as about as old as her mother. The film takes influence here from quality adult films and just give her pigtails. Instant teenager, right? I’ll admit I’m being a bit harsh on the small stuff but this is all that remains firmly in memory after watching Steele Justice. Outside a few goofball choice it just turns into a poor man’s mish-mash of Rambo, Commando, and the Missing in Action films. It lacks the strange logic of Andy Sidaris films or Ninja III and instead focuses on being a far too familiar action film. Ronny Cox even plays a police sgt that’s basically the same role he had in the Beverly Hills Cop films. In my mind, it makes both these films take place in the same universe. Steele Justice for me is unofficially a spin-off of Beverly Hills Cop. It’s not an 80s action film until you have your training montage with anthemetic rock blasting, and of course Steele Justice has one. The film does take some bizarre turns in musical cameos however. If you are into country-rock, there are some scenes of Chris Hillman (formerly of The Byrds and the Flying Burrito Band) performing with his 80s group The Desert Rose Band and a scene involving Astrid Plane, the original lead singer of synthpop group Animotion performing some delightfully poor choreography. Check out the backup dancers. Does poor dance choreography lead to poor action scenes? In this case yes, the fights are sparse and many involve either Kove either knocking out people with a single punch or running away from battle. Only in the final showdown scene is there any element of interesting cinematography and atmosphere to give the still poorly choreographed swordplay any grit it needs to deserve your attention. Steele Justice is not available on DVD and I manged to see it theatrically at a midnight show at the Mayfair Theater. 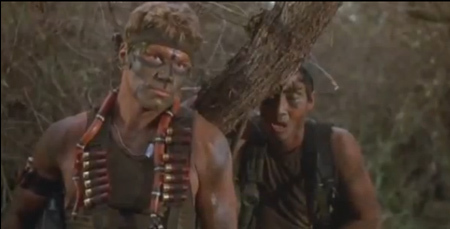 Their was even a pre-recorded video involving Martin Kove introducing the film. Kove didn’t get into too many details about the film outside that he was excited to not play a bad guy in his role and that the film was a fun movie to make. It’s not quite as fun as Kove may hope as in between a bad film’s overtly goofy moments we have a film that’s too afraid to keep up with these more bizarre risks and just hops into the realm of safe clean action film making that I can only recommend to people who have worn out their Missing in Action tapes and need to pick up a quick bargain tape off e-bay. This entry was posted on Sunday, July 29th, 2012 at 8:52 am and is filed under 1980s, martin kove, steele justice. You can follow any responses to this entry through the RSS 2.0 feed. You can leave a response, or trackback from your own site. Rented this tape back in the day, don’t remember anything of it other than that it was trash. For anyone who does want to give it a go, it’s available on Netflix instant, amazingly in HD too! It did skip a bunch of formats at least. Your are dead on correct for it being trash but I’ve read some other reviews out there and some people do really dig it. But I wouldn’t even rule it out coming on DVD though, even Megaforce was just recently released on DVD. Madness! I love Rob Boris´(this film´s helmer), take on teen romcoms, OXFORD BLUES. All this ludicrousness happens within the first five minutes of the film, and it just gets worst from there. The most incredible thing about this film is that it came out the same year as Lethal Weapon , Predator , RoboCop , Beverly Hills Cop II , The Running Man , The Living Daylights and A Better Tomorrow II . Needless to say this film did not make Martin Kove an action star, even Stallone ‘s Over the Top beats this by a country mile. Nope, didn’t make him a star, and over 25 years later he’s still best known for having his nose honked by Mr. Miyagi . Loveable trash. 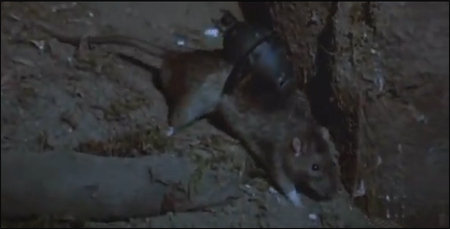 The rat grenade is the second best bit; my fave is his cauterizing a wound with a hot skillet. I laughed so hard, I missed half of that chase sequence.